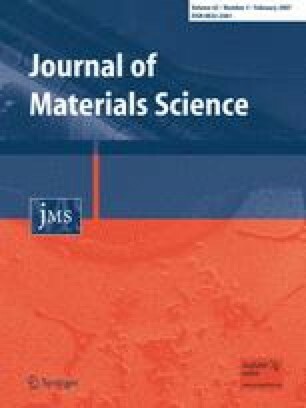 The thermal properties have been studied on a glass ceramic composite comprised of a barium osumilite (BMAS) matrix reinforced with SiC (Tyranno) fibres which has been subjected to a heat treatment in air in the range of 700–1,200 °C. Microstructural studies were carried out especially on of the interface between fibre and matrix. The presence of a carbon thin layer in the interface is a typical observation in SiC fibre-reinforced glass ceramic matrix composite systems. The microstructural evaluation and thermal properties showed a degradation of interfacial layer occurred at low heat treatment temperatures, (700–800 °C) this was attributed to the fact that, at those heat treatment temperatures the carbon rich layer formed during processing was oxidised away leaving voids between fibre and matrix, which were linked by isolated silicon-rich bridges. After heat treatment at higher temperatures of 1,000–1,200 °C, the thermal properties were retained or even enhanced by leaving a thick interfacial layer. The authors would like to thank to NPL (National Physical Laboratory) provision of samples of composites and Mr. I. Brough and Mr. P. Kenway for assistance with SEM and TEM studies. R. Yilmaz would also like to thank to Sakarya University for financial support.